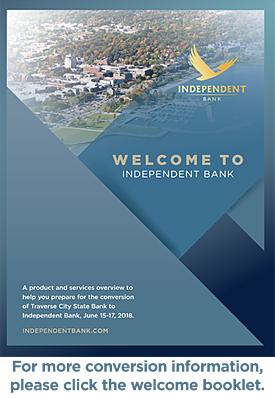 We are excited to serve the Northern Michigan market and to deliver financial products and services to help meet your goals. As a full-service bank, we look forward to offering options, tools, and services to make every aspect of banking easier and more convenient for you. At Independent Bank, we greatly value our customers and our communities. We see ourselves as more than just your bankers, but also your friends and neighbors. We are committed to providing exceptional service and value to our customers, our stockholders, and our communities. If you have any questions, please contact our Customer Service team at 800.355.0641, Monday-Friday 8 am-8 pm or Saturday-Sunday 8 am-6 pm (ET).